Here's a keys to the game article that touches on pretty much all of the same keys to the game for every Army Navy game. Maybe I'm just tired of hearing that Army needs to "take care of the football", but those keys look cliche'd. Here's a look at the Washington D.C.'s efforts to host their first Navy/Army game. It didn't hurt that FedEx Field is a 91,000-seat stadium, making it the largest venue to ever host the Army-Navy game. Sweeney said Saturday's service academy showdown is a sellout and that means more revenue for both institutions. Army Chief of Staff Ray Odierno and Chief of Naval Operations Jonathan Greenert have been posting on Facebook to stoke the friendly but fierce rivalry between the Army's U.S Military Academy in West Point, N.Y., and the U.S. Naval Academy in Annapolis, Md. Were were these guys after the teams' respective losses to Rutgers? This last one is a very nice article highlighting some of the history of the rivalry, it's a fun read. The Portal to Texas History has McMurray College Totem yearbooks available online. There are a few notes to add to the story of McMurray. 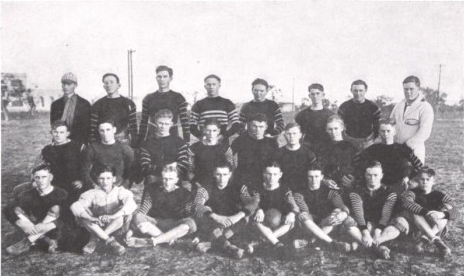 Firstly the school was created in 1923 - it is quite impressive that the school not only fielded a football team in it's first year, but also published a yearbook for that year as well. Also of note are these yearbooks' heavy reliance on native American imagery throughout the school's own history and traditions. McMurray's teams were named the Indians up until 2006 when the NCAA demanded that teams with Native American mascots change their names. From awading the honor of wearing the "Indian Head" to football letter-men to calling the J-V team "The Papooses", McMurray layed the indian stuff on thickly. Even as recently as 2005 the indian imagery was flat-out over the top. You can read how McMurray responded to the NCAA's house cleaning on their Wikipedia site. The scans are fine, with some years/pages turning out better than others, but I will add the one usability note that the Texas Portal Yearbooks are sometimes hard to peruse. I suggest clicking the "All Pages" button in the middle of the right sidebar. 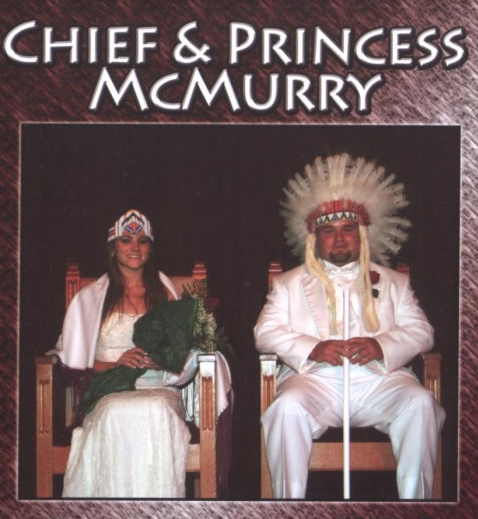 Another good yearbook: The McMurray College Totem. Andrew Rodriguez was awarded the William V. Campbell trophy earlier tonight. Carrying a 4.14 GPA as a mechanical engineering major, Rodriguez ranks third in a class of 1,052 cadets. He has posted 21 A-plus grades and recorded six terms with a GPA of 4.0 or higher. He is a two-time CoSIDA Academic All-District honoree and has qualified for the Dean's List five times. On the field, Rodriguez claims 140 career tackles in 23 career games. As a sophomore in 2009, Rodriguez stepped into the starting lineup at linebacker and led the Black Knights with 85 tackles while also registering two interceptions, three pass breakups, two forced fumbles, two fumble recoveries, 1.5 tackles for loss and 0.5 sacks. He recorded a career-best 15 tackles versus archrival Navy and also posted 14 stops against rival Air Force that season. Just try to top that. On a team of leaders from a school of even more leaders A-Rod's commitment to excellence paid off with this prestigious award. Well, I guess you don't have to... I purposefully go for long stretches without comparing Army and Navy on the gridiron. Army has been playing catch up for years now and are just now finding some stable footing in the coaching department. The schemes are right, the mindset is right - I have no reason to think that Ellerson isn't the right coach for the job. Navy found coaching stability by promoting Niumatalolo from within Paul Johnson's staff. Their success against the Cadets can't be argued. The Mids have won nine straight games against the Black Knights, the longest stretch of dominance by either side in a series entering its 112th meeting. Navy’s average victory margin in that span is 25.7 points, and the Mids have yet to lose since Paul Johnson was hired and installed the current triple-option attack after the 2001 season. The Mids have won the last nine encounters in very convincing fashion, outscoring Army 319-91 in those showings. Navy posted the series’ most lopsided back-to-back victories in 2002 and 2003, winning those contests by a total of 74 points. Army has been outscored 319-91. Army can chill with direct comparisons until they can beat Navy. Has Army closed the talent gap? Well, it has clearly been a large gap. Very large, 0-for-9 large; 319-91 large. Both teams are home for the postseason, but the last decade's worth of dominance gives Navy every right to brag about a percieved talent gap. They earned it... Navy: go ahead and boast. Once Army gets the next win in the series the talent gap talk is over. Well, over that is, until Navy decides about membership in the Big East. The story broke today that Houston, SMU, San Diego State, Boise and UCF will join the Big East. As per usual, the additions don't strengthen the league - but the current BCS rankings of Houston and Boise should save the league's BCS bid for the next evaluation term. The problem is that the constant evacuation of good teams in legitimate eastern markets has made the future Big East neither big nor eastern and definitely raises questions about the league's status as a BCS auto-qualifyer. Navy is no guarantee for the Big East. The Big East is hoping that Air Force can round on the west and Navy the east. But, for now, that's still just a plan. ...just as the Big East is no guarantee for Navy's success. If Navy goes they will lose control of most of their schedule and will, at least for a while, participate in a BCS conference presumably against BCS talent. That is a tougher go than what Army tried in the Conf. USA, but it is clear that Navy has the benefit of having a program that is pointed in the right direction. They aren't going to experiment with a pro-set, but they won't have many easy games week to week. My main concern is that Navy will languish in the conference with below-BCS-level talent but stockpile the top service academy candidates by virtue of the Big East auto-bid. I have no idea how it will turn out, but as long as Army stays independent I don't care even a little bit what anyone else in eastern football does. Conference membership could sink Navy as a program, but at the same time bolster their CIC trophy aspirations. Not to be confused with the last week of the season, here is another questionable blog poll. I wanted badly for Cinci to make the top 25, but I couldn't justify adding them. Other than bumping Saturday's winners there isn't too much new blood in my ballot. I just might get the swing award again this week by virtue of Oregon making their way back on the ballot - and the fact that I bumped OK State all the way up to #2. You can call them a champion, and you can call me impressed. Regarding dropping Alabama down to fit Oklahoma State in at #2 may be questionable to some, but I saw what I needed to see this past weekend to jump not just Bama, but also idle Stanford. 3-6 played themselves out of contention and OK State gets the #2 nod in my book. I'm vaulting Oklahoma State over Alabama not only on the back of their Big XII Championship run, but by virtue of the BCS system itself. OK State is good enough to compete in the BCS title game, and they deserve the shot: Big 12 champion vs SEC champion. Alabama's season has been nothing short of remarkable, but they had their shot - at home, and they lost. I don't want to hear about how close of a game it was - this is 2011, ties were abolished in 1996. The BCS is a system that has placed so much importance on winning that they have again and again changed the time tested rules of the sport to cater to the institution of overtime. So why are we going to pretend that Alabama did something special by losing to LSU? Under the BCS a loss is a loss, OT or regulation. Personally I think that way of thinking is BS, but that's the situation the BCS put us in. Alabama didn't win a championship this year, they sat on their couch and watched OSU and LSU go out and achieve their goals. Oklahoma State and LSU earned their way into the title picture while Alabama just kind of hung around. I don't want to predicate BCS champion with league champion for a couple of reasons. Neither the Big Ten champion nor the Big East champ had a whiff of the BCS title game. Conference champion does not equal BCS championship bid. My whole point is that if Alabama tied LSU in regulation we would have two undefeated teams prepared to rematch for the title. It wouldn't even be a question 12-0-1 LSU vs 11-0-1 Bama... brilliant. Who wouldn't want to see that? As it is one of those teams remained undefeated while the other dropped to second place. Why? Because they were tied at the end of 60 minutes? THEN WHY DO WE EVEN HAVE TIES? Every overtime game in history has been a meaningless exhibition, a transplanted inflamed appendix and each OT in turn has been a novel waste of time. Why do we even have OT? I thought OT was concocted to provide a clear winner for these new-fangled national championship games. Well it's not hard to recall a number of recent seasons that ended in a championship game, yet still gave no clarity to the question of who is #1. And I can live with that. I don't need a clear-cut #1 every single New Year. I appreciate the discussion, debate and argument that follows NCAA football deep into the NFL's January postseason. That is what makes it fun. Why are we, as fans, so in need of instant Win or Lose gratification that we accept a more muddled overall rankings picture just to see who *would have* won. Your team ties? fine. Move on and finish your season. Two teams undefeated after bowl season? Split the title, that is great - you can guarantee that college football fans will be talking about who was really better for years.